The American financier and politician Robert Morris, a signer of the Declaration of Independence, was born in Liverpool, England, on the 31st of January 1734. He emigrated to America in 1747, entered a mercantile house, and in 1754 became a member of a prosperous firm, which was known successively as Willing, Morris & Co., Willing, Morris & Inglis and Willing, Morris & Swanwick. In the conflict with the mother country Morris took the side of the colonists, but associated himself with the conservative group of Pennsylvania Whigs who followed the lead of John Dickinson and James Wilson, rather than with the more radical faction represented by Thomas Paine. He was vice-president of the Pennsylvania Committee of Safety (1775-76), and a member of the Continental Congress (1775-78). At first he disapproved of the Declaration of Independence, but he joined the other members in signing it on the 2nd of August. He retired from Congress in 1778, and was at once sent to the legislature, serving in 1778-79 and in 1780-81. His greatest public service was the financing of the War of Independence. 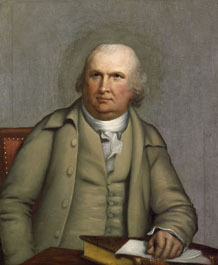 As chairman or member of various committees he practically controlled the financial operations of Congress from 1776 to 1778, and when the board system was superseded in 1781 by single-headed executive departments he was chosen superintendent of finance. With the able co-operation of his assistant, Gouverneur Morris -- who was in no way related to him -- he filled this position with great efficiency during the trying years from 1781 to 1784. For the same period he was also agent of marine, and hence head of the navy department. Through requisitions on the states and loans from the French, and in large measure through money advanced out of his own pocket or borrowed on his private credit, he furnished the means to transfer George Washington's army from Dobbs Ferry to Yorktown (1781). In 1781 he established in Philadelphia the Bank of North America, chartered first by Congress and later by Pennsylvania, the oldest financial institution in the United States, and the first which had even partially a national character. A confusion of public and private accounts, due primarily to the fact that his own credit was superior to that of the United States, gave rise to charges of dishonesty, of which he was acquitted by a vote of Congress. He was a member of the Federal Convention of 1787, but took little part in its deliberations beyond making the speech which placed Washington in nomination for the presidency of the body. On the formation of the new government he was offered, but declined, the position of Secretary of the Treasury, and urged Alexander Hamilton's appointment in his stead. As United States Senator, 1789-95, he supported the Federalist policies and gave Hamilton considerable assistance in carrying out his financial plans, taking part, according to tradition, in arranging a bargain by which certain Virginia representatives were induced to vote for the funding of the state debts in return for the location of the Federal capital on the Potomac. After the war he gradually disposed of his mercantile and banking interests and engaged extensively in western land speculation. At one time or another he owned wholly or in major part nearly the entire western half of New York state, two million acres in Georgia and about one million each in Pennsylvania, Virginia and South Carolina. The slow development of this property, the failure of a London bank in which he had funds invested, the erection of a palatial residence in Philadelphia, and the dishonesty of one of his partners, finally drove him into bankruptcy, and he was confined in a debtors' prison for more than three years (1798-1801).